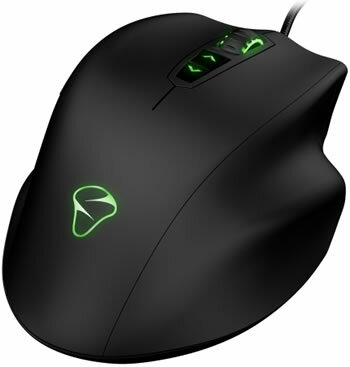 Mionix has launched a new flagship gaming mouse that builds on the venerable Naos 3200 and Naos 5000. Touted as "the new standard for high-end gaming nice," the Naos 8200 packs an 8200 DPI laser sensor that is driven by a 72MHz 32-bit ARM processor and promises to provide the "most accurate" gaming experience. While some folks might be jazzed about the new sensor, what's likely more important is that Mionix hasn't messed with the attributes that earned its previous mice a loyal following. Top on that list is an ergonomic design, and we assume it's by no coincidence that this is also the first thing the company's press release highlights. Although many companies claim their gaming keyboards and mice are ergonomic, few actually offer the anatomically accommodating design that you'll find with a specialty device. However, the Naos comes close -- or at least much closer than some other mainstream options -- with a large shell that can seat all of your fingers. Other features include 128kb of integrated memory to store your settings and macros (five profiles are supported and they can be toggled on the fly), a customizable multi-color LED system with "pulsating" and "breathing" effects among others, a tool that can measure the tracking quality of your mousing surface, three DPI presets, seven programmable buttons as well as an adjustable polling rate and lift distance. Mionix has opened preorders worldwide for $89.99 / €89.99 / £89.99 / 899 SEK with units expected to ship this month. Of note, the older Naos 5000 is currently going for the same rate on Newegg. It's unclear if the 8200 is meant to succeed the 5000, but it seems unlikely that both will exist at the same price for long, so you may want to watch for a nicely discounted Naos 5000 if you don't care about the new features.